A pasta classic, our Alfredo Pasta Sides' delectable sauce brings the creamy flavor of Parmesan and Romano cheeses to dishes like our Creamy Shrimp Alfredo. 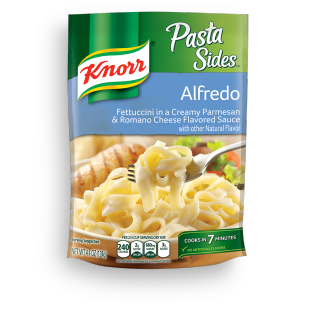 Decadently creamy Knorr® Pasta Sides™ Alfredo becomes a delicious meal for four when you add juicy shrimp, plump cherry tomatoes and vibrant fresh spinach. This simple shrimp alfredo recipe is one everyone will love. Alfredo Pasta is rated 4.6 out of 5 by 268. Rated 5 out of 5 by Phyllis from Perfect!!! I've been serving this to family and guests for years and everyone loves it. I usually serve it with canned chicken and I think it tastes just like the great Italian chain restaurant that's in most cities everywhere. If it's made exactly as directed on the package it will have a perfect creamy texture. If not, I have to believe it's the cook's fault. Sorry.....but it has to be. Rated 4 out of 5 by WeLoveKnorr from Clearly, You're Doing it Wrong All of the Knorr Pasta Sides are a great success in my house, and have been for many years. The sauces thicken upon standing and most of the water is absorbed as the pasta is cooking. If you still insist on doing it wrong, you can always add a tiny bit of cornstarch or flour to thicken up any sauce. Rated 5 out of 5 by auncw from I love these. I've been eating these for years. I recently started adding frozen peas to it and it is now my favorite way of eating it. Great for a quick meal. It's not like soup like the other reviewer said. They aren't cooking it right. Rated 4 out of 5 by t00dlessara from I love these pasta sides. My little brother tried to make this for me after work one day when I was tired. I appreciated the gesture when he served me hard noodles in seasoned water. Haha. It was a fun memory. When it’s cooked normally it tastes really pretty good. I recommend coaching your autistic siblings before having them serve you some up. I like that they put coupons on the packaging but I think if the instructions hadn’t been so small, my brother could have read them and understood them a little better. Maybe the packaging design could be rethought to be a bit more inclusive. Otherwise, YUM.